(Dec. 2013) - In the afternoon we visited Chateau Lanyi (also spelled Lanny), which has as its symbol the native grey-blue rock of the region. 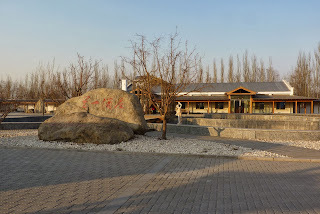 The tasting room is fittingly designed in a Chinese style with a long low building and wide porch with posts. 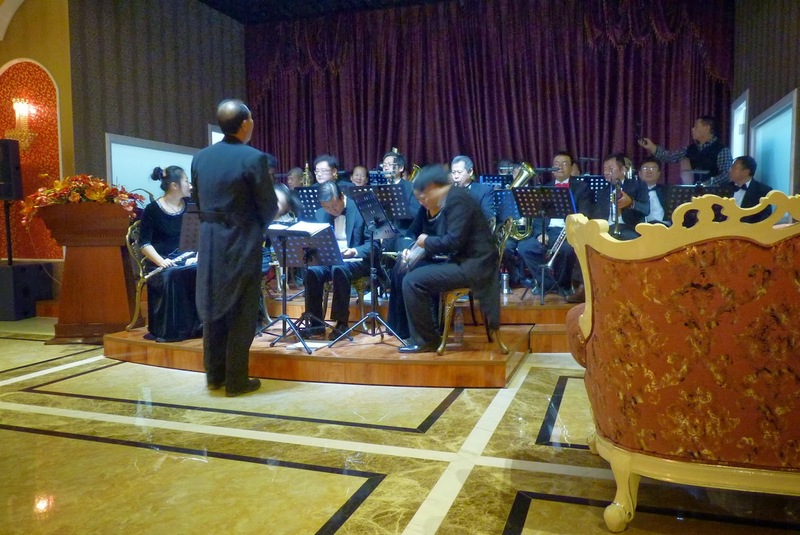 There is also a restaurant, game room, and beautifully decorated hotel rooms on site. The front of the property has a small pond, picnic tables with Chinese roofs, and a table grape vineyard in addition to the wine grape vineyard where tourists can walk in arbors under hanging grapes in the summer. 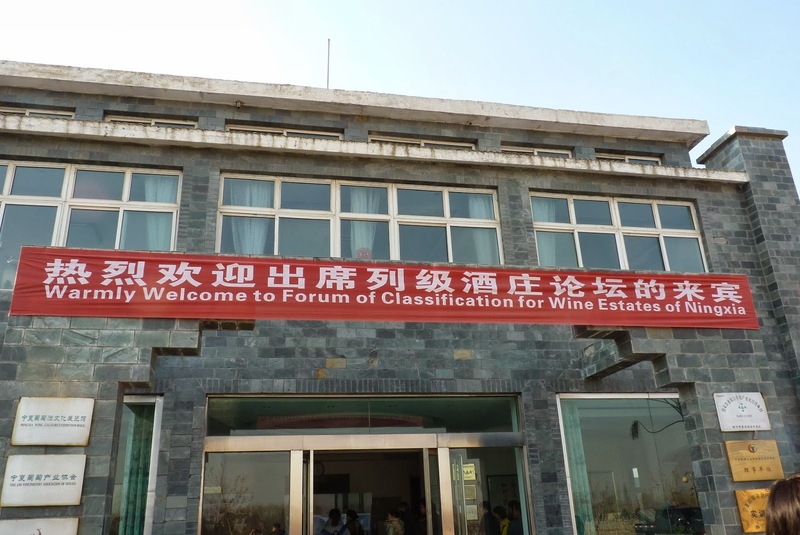 The winery is owned by Mr. Cao, who is the Director of the Bureau of Grape and Floriculture Development, and is responsible for managing the implementation of wine tourism development in Ningxia. He was also our host and the organizer of the wine tourism seminar. 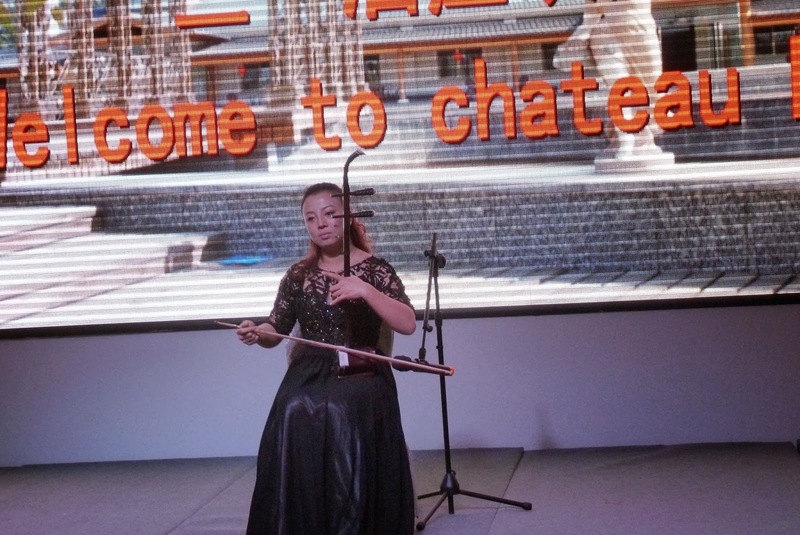 His enthusiasm and clear vision for the future of Ningxia was contagious. 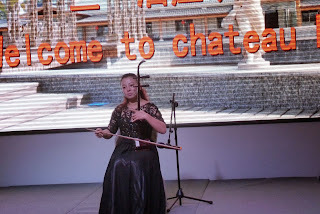 After a tour of the property, we were treated to traditional Chinese music played on a guqin (a stringed instrument from the zither family) by a beautiful female musician. Next was a buffet dinner, and the opportunity to taste the 2010 Chateau Lanyi Merlot and two of the 2011 Chateau Lanyi Cabernet Sauvignons. The merlot was darker in color than the cab, with a very savory spicy note that caused me to ask the name of the clone. I had tasted several other merlots like this while in Ningxia, but unfortunately no one knew the name of the clone. It’s unique flavor profile made me think more of St. Emilion wines than Napa, and I wondered if it would be better used as a blending grape than on its own. The cabernet sauvignons were light and fruity, with the unoaked one tasting more like Beaujolais. It was very approachable and fun, and also served with our lunch each day where it paired beautifully with the food. The 2011 reserve cab with more oak and Chinese Gernischt, had a slightly bitter and acrid taste at first, but after some air, it opened up a bit. The 2011 vintage was cooler, so I found many of the 2011’s to have a sharp herbal note. Definitely vintage makes a difference here as in other parts of the world. Many of the winemakers reported that they felt 2013 was going to be one of their best vintages. The evening was very enjoyable. 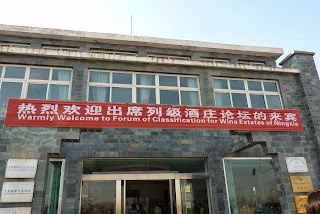 With the help of Qin as a translator, we learned more about the wine vision of Ningxia from Mr. Cao, and how the new classification system worked. We all were quite impressed with the strategic thinking and progress that has gone into developing the region. 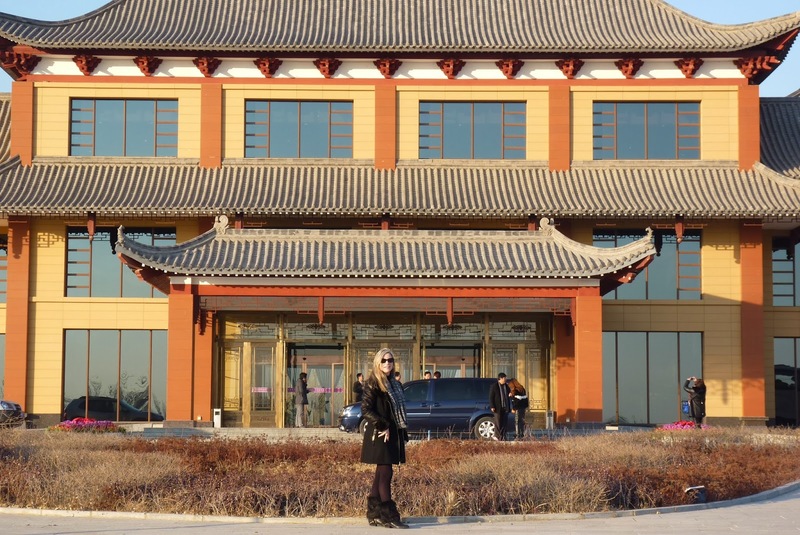 (Dec. 2013) - The next afternoon we visited Chateau Helan Quingxue which is housed in a more modest structure of red brick and reminded me of a combination of Soviet and Chinese architecture. 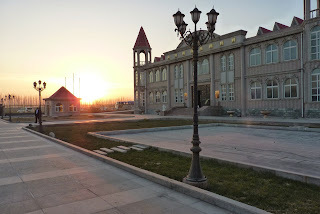 Inside there is a modern winery with stainless steel tanks, a small barrel room, and a very large visitor’s center. Though not finished yet, this part of the winery is designed to showcase all of the wines of Ningxia so that visitors can taste all of the brands in one location. 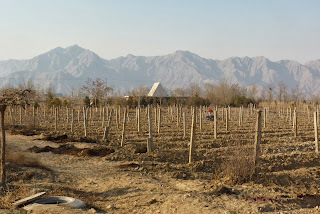 We visited the vineyards, and I was impressed with how close they are located to the foothills of the Helan Mountain range. It makes an impressive scene with the orderly vineyards and the dark, magnificent rise of the mountain beyond. The vineyards were planted in 2005 and total 15 hectares. 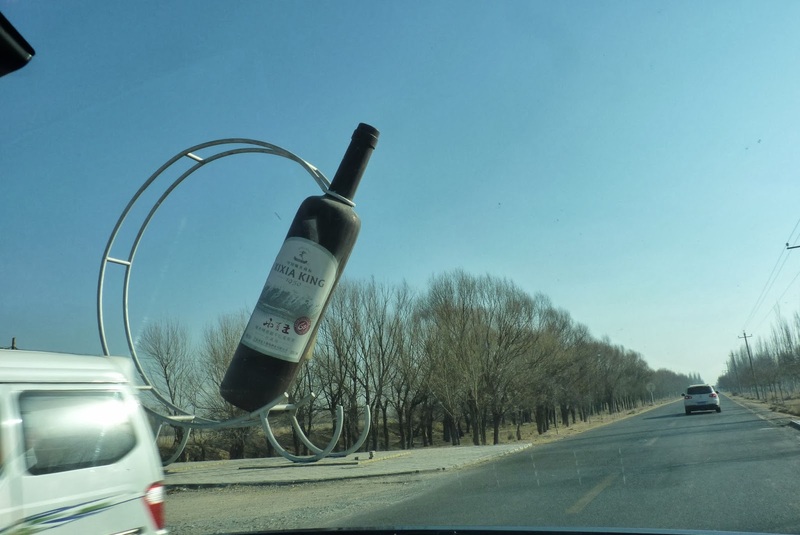 The winery produces around 50,000 bottles per year, or 4,166 cases. We tasted a 2012 Italian Riesling Jaibeilan Dry White Wine and the 2009 Jaibeilan Cabernet Sauvignon “Baby Feet.” The Riesling was fresh and fruity with floral notes. It would be an easy sell in California. The cabernet was part of the same famous batch that won the 2011 Decanter International Trophy Awards, but “Baby Feet” refers to four special barrels that were set aside with more oak and “stamped” with the footprints of Jing’s baby, whom she carried and then delivered during the winemaking process. A very sweet story. 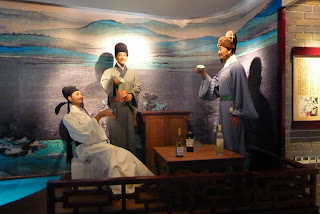 While there we saw a group of Chinese women applying labels to wine bottles by hand (See photo). This was my second visit to this winery, and I have to admit, that it was just as joyful as the first time last year.